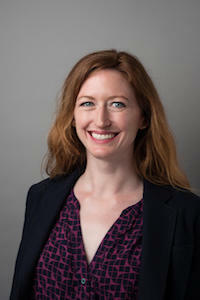 Elizabeth O’Malley is an arts non-profit and policy professional, specializing in public sector solutions that strengthen creative communities and encourage social impact through arts engagement. She currently serves the Bay Area arts community as Executive Director of the Roxie Theatre in San Francisco’s Mission District. Elizabeth has built a decade long career in arts administration and advocacy, working for iconic California cultural institutions including the Sundance Institute, Skirball Cultural Center and Laguna Playhouse. She received her MPA from UC Berkeley’s Goldman School of Public Policy, with a focus in arts policy and creative placemaking practices. During this time, she served as a consultant to the City of Oakland, recommending how an Arts and Culture District program could be used to prevent artist displacement and encourage equitable access to the arts. This report is currently being used by the city in the development of a Cultural Plan and was selected as one of three finalists for the Goldman School’s Bardach Prize for Outstanding Capstone. Elizabeth received her BA in Theatre from Cal State Fullerton, with an emphasis in musical theatre performance, and is a native of the Bay Area.